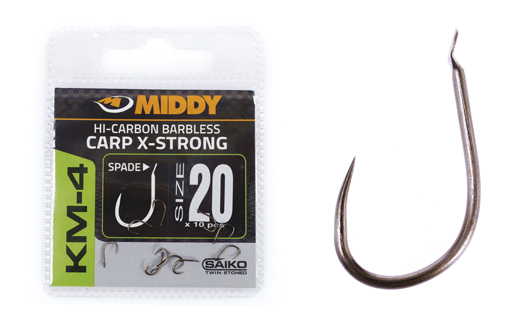 www.middytackle.com > Hints & tips >> General advice > WHY IS THE KM-4 SUCH A GOOD HOOK CHOICE? WHY IS THE KM-4 SUCH A GOOD HOOK CHOICE? The KM-4 is essentially a spade end version of the pre-existing and very popular KM-2 eyed hook. It is made from the same 110 grade Japanese high carbon steel, which has a dull Teflon finish that both protects the hook point and ensures that the hook does not glint under water. The Teflon is not just a coating, however - it actually impregnates the steel by a 1000th of an inch (0.001") and also protects the hook from corrosion and pitting. The KM-4 is a medium gauge hook with incredible strength for summer baggin' sessions and it has a beak in-turned point, which ensures perfect hooking every time and is ideal for use with pellets. This hook pattern is the choice of anglers such as Kieron Rich, Chris Cameron, Lee Thornton and Pete Upperton. In fact, Kieron Rich recently teamed up KM-4 hooks with M-TECH® to qualify for the final of 'Match This'. It is part of the 'KM' range of hooks (KM-1, KM-2, KM-3 and KM-4) which are all super sharp and feature the ideal beak point shape for carp. The size 20 on the KM-1 and KM-2 also have a larger eye to accommodate a knotless knot on 0.20 line. 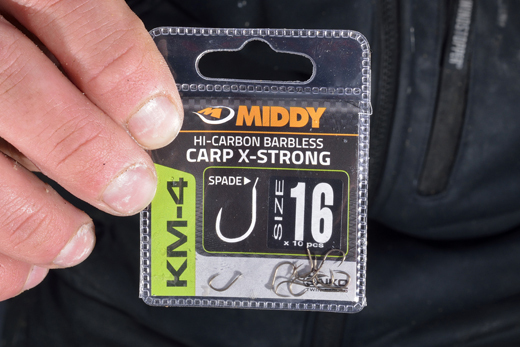 KM-4 hooks are priced at £1.59 RRP per 10pc packet and are available through any MIDDY® stockist in sizes 10, 12, 14, 16, 18 and 20. If you haven't tried this pattern yet, now is the time to give it a go! > WHAT IS SINK RATIO?